If you want to give your skin the best possible care, it is important that you know which skin type you have. Skin types are known to change as we get older, so it is common for someone to assume they have the same skin type they did as an adolescent. If it has been years since you have really reexamined the quality and condition of your skin, your skin care routine and anti-aging plan may not match your true skin type any more. Continue reading to learn how to identify your true skin type. There are infinite variations of skin types, but the average person fits into one of three primary categories: oily, dry, and combination skin. Within these 3 primary skin types, there are various levels of being affected. 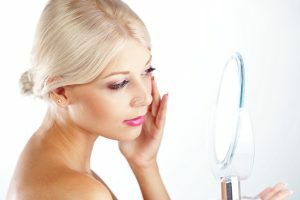 It is possible to add a fourth category for sensitive skin, however, sensitive skin is really just other versions of dry or combination skin. If you are unsure which skin type best matches your skin, just look for the common signs of each. ❶ Oily Skin – It is common for skin to feel oily by the end of the day. However, if you can feel oil on your facial skin by morning or mid-day, your skin type is likely oily. Oily skin is more prone to acne, and can cause an undesirable sheen. On the other hand, it generally offers better sun protection. With proper skin care products and practices, oily skin can be easily managed, and even reduced. ❷ Dry Skin – Dry skin is evident by signs of flaking, cracking, redness, irritation, and heightened sensitivity. If you skin experiences these symptoms when you use products on it, you likely have dry skin. ❸ Combination Skin – Combination skin types are simply those that exhibit both oily and dry symptoms. Certain parts of the skin can be oily, while other areas are dry. Some areas can be more sensitive than others, and so forth. If your skin fits this description, you likely have combination skin. To truly identify your skin type, you must first stop using any harmful products for several weeks. This includes alcohol-based products or products that use menthol, peppermint, eucalyptus, citrus oils, citrus juices, lavender, witch hazel, and other harsh ingredients. Also cut out fragrances and scented products, thick moisturizers (unless you have severely dry skin), abrasives, harsh cleansers, stiff-bristled brushes, and essential oils. After 2 or 3 weeks, your true skin type will begin to show. Now you are ready to do the test and find out once and for all which skin type is yours. ➀ Wash your face with warm water and a mild cleanser. ➂ Apply a gentle, skin-replenishing toner with antioxidants and other essential minerals. ➃ Wait 30 minutes and then look in the mirror and examine your skin. ➙ If your skin is showing signs of oil and shine, you have oily skin. ➙ If your skin is showing signs of dryness and feels tight, you have dry skin. ➙ If your skin is oily in some places and dry in others, you have combination skin. ✨ Tune in soon for an upcoming blog about recommended skin care routines for oily, dry, and combination skin! Looking for Great Skin Care Products to Enhance Your Tan? This entry was posted in Skin Care and tagged Indianapolis tanning deals, skin type test, Skin Types, tanning skin care, whats my skin type. Bookmark the permalink.